Disneyland Monte Cristo Sandwich. Of course it made our list. How could it not? The rides and attractions aren’t the only experiences at Disneyland. Any regular Disney-goer can conjure up a few must-eat items —and, yes, there are mouse-shaped snacks aplenty — but other great dishes are flying just under the radar or off the main tourist drag. These are the Disneyland foods that will make your next trip to the Happiest Place on Earth completely satisfying. Dole Whip is a soft-serve, frozen pineapple treat that’s sweet, tart, and gluten- and dairy-free. Have it in a cup, or add it to a float with pineapple juice. Find it at the Tiki Juice Bar in Adventureland, and at the Coffee House in Disneyland Hotel, where you can (and why wouldn’t you?) add a shot of rum! 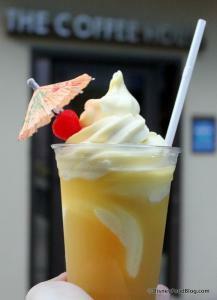 Dole Whip is one sweet that’s so iconic it’s been immortalized in air fresheners, pillows, purses, jewelry, and more. Churros are big, long donuts covered in cinnamon-sugar and served warm. But, whatever. Do I really have to explain churros to you? You already know. 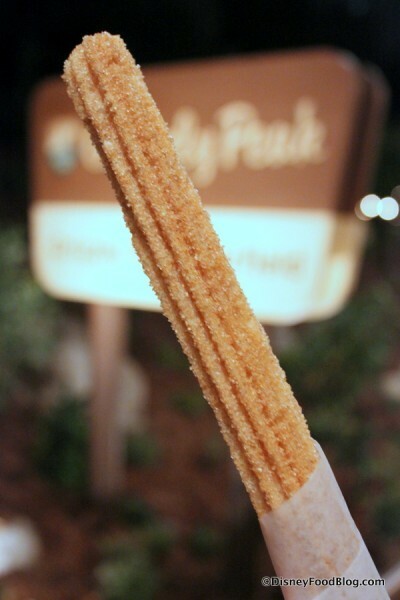 What makes Disneyland’s churros special is the themed, limited-edition flavors, like the golden lemon churros for Pirates of the Caribbean and blue and red lightsaber churros for Star Wars. Really, you should probably just eat everything that has corn in or around it in Disneyland: corn bread, elote, corn on the cob, corn on the anything. It will always be good. 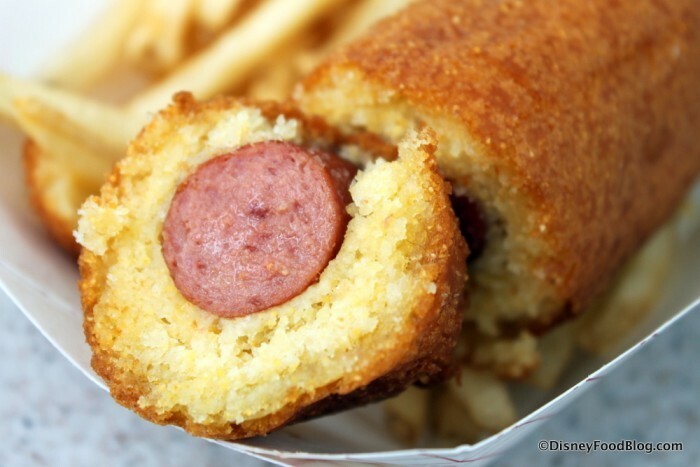 But Disneyland works some special voodoo when it comes to its corn dogs. Hand-dipped and luxurious (yeah, I said it) cornbread exteriors set these way apart from your run-of-the-mill corn dog. Find them at Corn Dog Castle (naturally) in Disney California Adventure, and Little Red Wagon, and Stage Door Cafe, in Disneyland. Vanilla ice cream enveloped in a “chocolatey coating” (that’s the official term) and shaped like a silhouette of your favorite mouse. Who wouldn’t want to eat this? Find it at just about every ice cream cart and freezer anywhere in Disney. Grab one and ‘gram that quintessential “first Mickey Bar” pic. Extra points if you give it to a toddler and they get covered in chocolate. 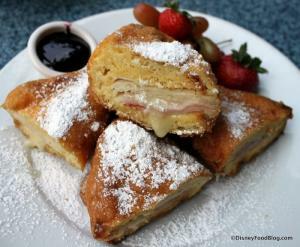 The Monte Cristo at Cafe Orleans, or Blue Bayou Restaurant is the best plate of food you can get anywhere in Disneyland. 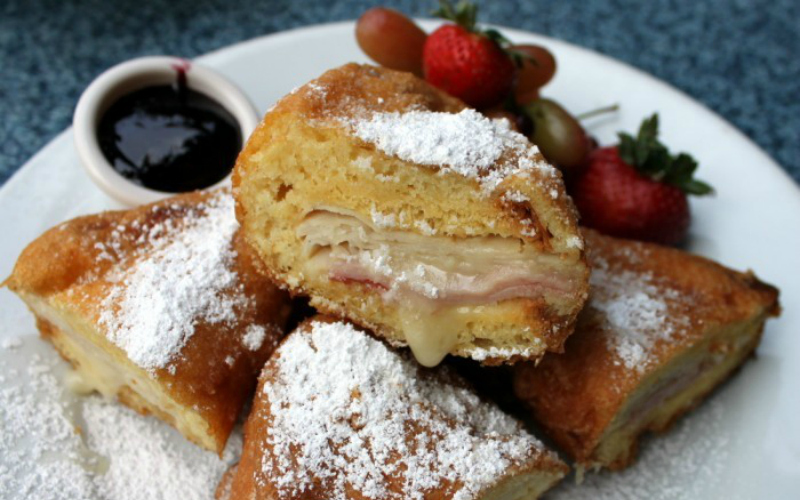 It’s basically a ham, turkey, and Swiss cheese sandwich, but the magic happens when the whole thing is battered, deep-fried, and served with berry sauce for dipping. Vegetarians can skip the meat and order a three-cheese version instead. Note that the same sandwich is cheaper at Cafe Orleans than at the more upscale Blue Bayou (and Cafe Orleans also has killer pommes frites). I don’t know what they do to the fried chicken at the Plaza Inn, and I don’t care. It’s the best. They only serve it for lunch and dinner. 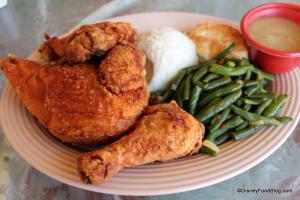 It comes with mashed potatoes and green beans. The serving is humongous. So large that one could easily share, but I don’t. 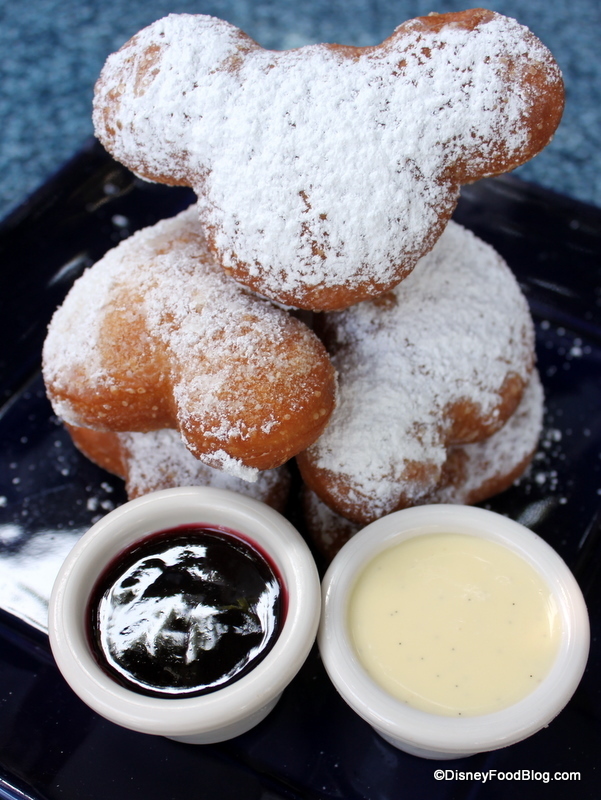 These fried doughnut-like treats are like little, Mickey-shaped pillows of heaven. 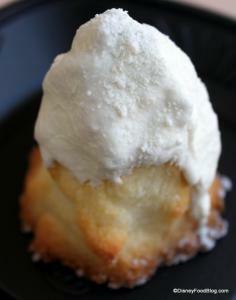 Dusted with powdered sugar (and sometimes flavored for holidays), they’re must-eats in Disneyland. Find them at Cafe Orleans (again, because this place is frigging gold) with dipping sauces, or pick up a bag at the Mint Julep Bar. Wherever you find them, you’re in for a sugary-sweet delight. Mint Julep Bar in New Orleans Square is tiny and hidden (look for it behind French Market in New Orleans Square), but it serves two iconic Disney treats. The Mickey Beignets we’ve already discussed, and Disney’s take on a mint julep. 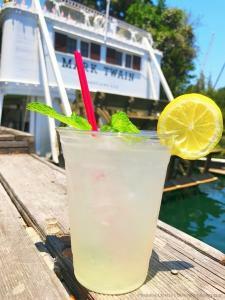 The mint julep (non-alcoholic, because it’s Disneyland, and not technically a julep at all, really) recently underwent a make-under, during which the neon green hue was toned down to a more natural pale yellow, and the mouthwash-esque flavor was ditched in favor of a more subtle lemon-lime-mint. Drinking the mint julep is a classic way to chill out in Disneyland, and now it’s better than ever. Newer than some long-running Disneyland snacks, but no less essential, is the Matterhorn Macaroon. First introduced at Blue Ribbon Bakery, the Matterhorn Macaroon now moved over to Jolly Holiday Bakery. This huge, coconut macaroon is topped with white chocolate and dusted with candy “snow.” Best of all, it’s shaped exactly like Disneyland’s iconic Matterhorn ride. This must-get not only looks great, but is also truly delicious. 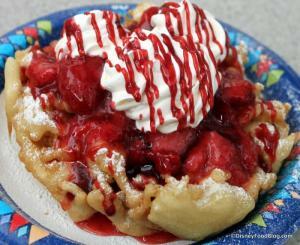 Funnel cakes are a theme park classic everywhere, but Disneyland does them better than anybody. They’re huge— like the size of your head—and loaded with strawberries and whipped cream or brownies and whipped cream at Stage Door Cafe. At Hungry Bear Restaurant, you can get a churro version (yes, pls) as well as seasonal varieties like the apple pie funnel cake and the current milk-and-honey funnel cake during limited times throughout the year. In the world of Mickey-shaped foods, Mickey waffles are pretty high on the totem pole. They’re made with golden malted flour, which makes all the difference. You can find them at lots of locations, including at the Grand Californian’s White Water Snacks, outside the park. Inside the park, you’ll see them on breakfast menus at Carnation Cafe and the Plaza Inn’s character breakfast buffet. There’s something so quintessentially Disneyland about seeing folks walking by with giant turkey legs in their hands (or am I thinking of the Renaissance Faire?) These huge hunks of turkey meat, perplexingly, look and taste like ham. Located at carts throughout the park, the Disneyland turkey leg has a cult following. Love it or hate it. A day in Disneyland calls for an ice cream cone, and at Carnation Cafe, Gibson Girl Ice Cream, and Clarabelle’s Hand Scooped Ice Cream, you’ll find sundaes with a Mickey twist. 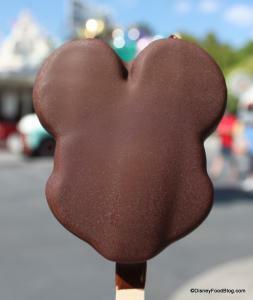 Get one with the two little chocolate discs that form Mickey’s ears, and you have the perfect Snap. Popcorn is a snack practically made for Disneyland! It’s portable, delicious, and utterly sharable. Plus it’s beloved by even the most picky of eaters. Disneyland popcorn is readily available at any number of popcorn carts throughout the park, and no Disneyland day is complete without it. Don’t forget to pick up your refillable bucket if you’re an Annual Passholder! Chimichangas are a hidden gem of a snack; just be warned that they’re super filling. You can grab your chimichanga at any of the carts that sell turkey legs, and, while they may not be much to look at, they’re comforting in a beans-and-beef-in-a-fried-tortilla kind of way. A Granny Smith apple swathed in caramel, covered in chocolate, and decorated like Mickey Mouse? Sign me up. Find these impossible-to-eat-but-you-still-have-to-get-one at Candy Palace, Trolley Treats, and Marceline’s Confectionery. Bengal Barbecue is tiny in size but mighty in punch. It features some seriously delicious meat skewers and other fare, but the favorite order is the Safari Skewer. Bacon-wrapped asparagus, grilled to perfection. And it’s practically healthy, right? After all, even bacon-wrapped vegetables are still vegetables. While these fancy French fries from Cafe Orleans might seem simple, they are actually spectacular. It’s (almost) all about the condiments with this one. The pommes frites are served with cajun remoulade, and you should definitely request extra. The fries themselves are tossed with parmesan, garlic, and parsley, so they aren’t shy about packing some flavor, but seriously, the remoulade is the stuff of dreams. TFW you get clam chowder in a bread bowl on a chilly Disneyland day. All the feels. You can find corn chowder, gumbo, clam chowder, and more in Boudin bread bowls at Royal Street Veranda, French Market Restaurant, Pacific Wharf Cafe, and Harbor Galley. It’s a classic Disneyland eat. Carnation Cafe serves up an epic baked potato soup, and a side of Disneyland history as well. Chef Oscar Martinez is the longest-serving Disneyland cast member, cooking at the park for over 60 years. Though he’s mostly retired from working the line at this point, his warm and welcoming influence is still ever-present, including in this yummy soup that will leave you feeling all the food love. The fried pickles at Carnation Cafe have developed a cult following. These parmesan and panko-crusted pickle spears are fried golden brown and served with house sauce. The combination is a taste sensation — salty, dilly, and tangy all at once. They are delicious and crispy, without being super filling. Get ’em. For an ice cream treat that’s custom-designed, stop into Clarabelle’s in Disney California Adventure, where cast members will hand-dip and hand-decorate your ice cream bar with toppings of your choice, from chocolate chips to fruity pop rocks. This treat from the Cozy Cone Motel is a carb lovers dream. It features creamy macaroni and cheese inside a large cone made entirely of bread. As if that’s not delicious enough, they sprinkle bacon on top. It’s a clever, edible vessel, and makes any trip to Cars Land even better! A.J. Wolfe is the publisher of The Disney Food Blog, which produced this video about Disneyland’s best foods and includes many of the menu items on this list.